anyone got some bananna pups to trade? I'd like to grow a bananna tree that at least gives me some bananas to eat.I'll trade some brugmansia cuttings. What kind of brugs do you have? 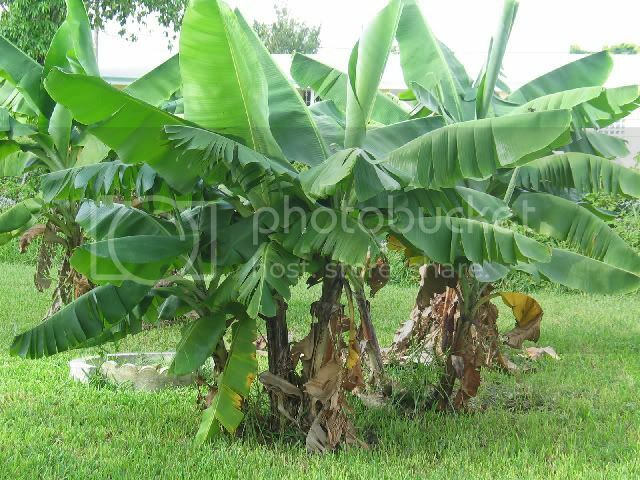 Rite, how long does it take a pup to make a tree and actually have bananas to eat? Light: Bananas do best in full sun. Moisture: Bananas require a constantly moist, but not flooded, soil, rich in humus and composted organic matter. The pH should be 5.5-6.5. Bananas require 10 to 15 months of frost free weather to produce a flower stalk, and then another 4 to 8 months to ripen fruit. Temperatures below freezing will kill the foliage to the ground. The rhizomes, hardy to 22�F (-5.5�C or lower, will send up new shoots when the weather warms again. If cold weather threatens, a banana plant can be protected by covering it with a blanket or tarp and burning a light bulb inside the tent. I have another question-do your own bananas taste like the store ones, or better and different? Do they ripen on the tree and you just go out and pick one and eat it? P.S. 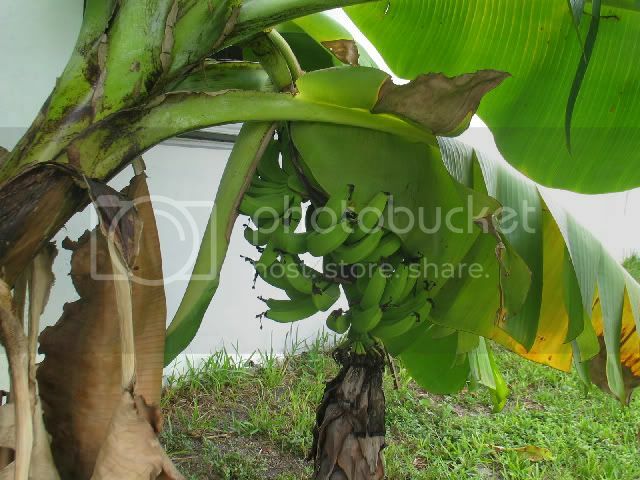 After the fruit ripens, the banana plant falls over and dies and its pup then grows up and starts the fruit production cycle all over again. Oh ! OK, now I get it...thanks ! I sure would like to get one IF there's a variety that would grow in a big pot. I might have other cuts of knightti& cypress gardens& jamicia yellow.I've not heard back from all on my list. The bannana I tasted...It was sweeter than store bought.It was very good.I just have the cold hardy type.it looks good,grows good.I bet the one I ate was watered good...at least this month. Here is the bananna hubby picked off and brought home. It was very tastey.It was better than store bought. mailed package today,you should get it about Thursday.